After waiting about 20 minutes, we notice we’re about 50 feet past an exit, which seems like it might enable us to escape the wait. However, there are a lot of cars between us and the exit, and getting there requires that some people back up. Since everyone is stopped, I get out of the car, and start motioning at people in an effort to help us move. Some nod and wave, others lean out and speak to me in Hebrew. I don’t know what they’re saying, but fortunately they comply, and I end helping a number of cars make their way off the freeway. After a few moments, Gadi pulls up next to me, and I jump back in as we also escape. Hooray! Arriving at the Pageflex office, we go upstairs and I set up in their conference room around 11. Elly’s team is interested in knowing more about MindFire, our marketing automation platform, and how our architecture handles automation of multi-channel elements. They ask some great questions, and we have a lively discussion. Around 12:30, Elly and I leave for lunch at a nearby location (which again, is really good), and return for a 2:00 Passover ceremony. 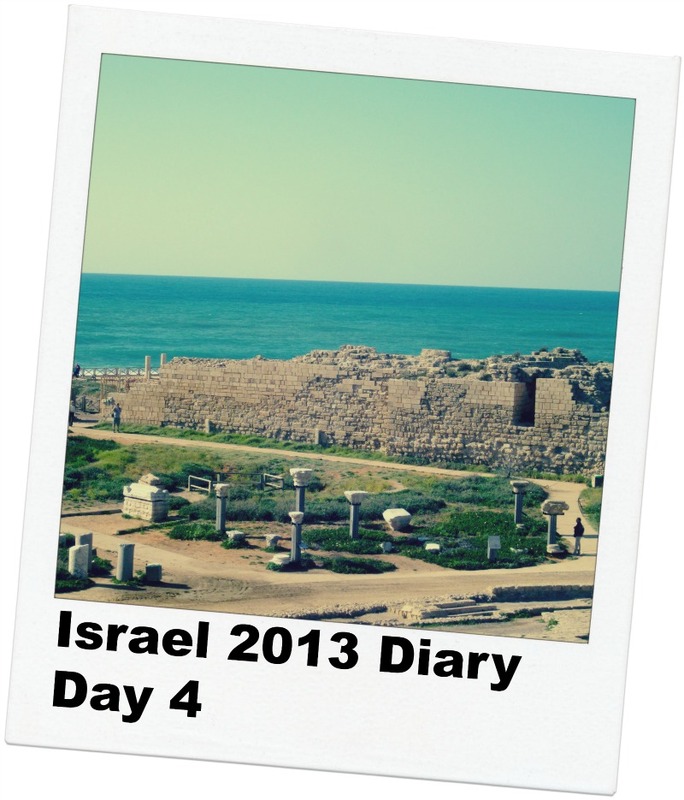 At 3:00, we leave for Caesarea, which is town built by Herod the Great about 25–13 BCE. Elly is an unbelievable tour guide, and takes me from place to place, describing the history starting about 2,000 BC. Yes, that’s right — we start there and travel forward through the centuries. I enjoy history immensely (especially when I’m on location), so I think Elly can tell I’m an eager listener and provides a great overview of the incredible landscape. If you intend to visit Israel, Caesarea is a must. The sun sparkles off the ocean, a warm breeze brushes our faces, and the beauty of thousands of years spreads about us. After walking about the area (which is quite large), we spend some time talking at a small restaurant; seated on the Mediterranean, with the waves lapping at the beach, time seems to slow down. Know the feeling? Around 5:30, we head back towards Tel Aviv, arriving to the hotel around 6:45. At 8 PM, the HP opening reception begins, and I spend a few hours mingling with HP clients, prospects, and partners from around the world. I have a great time and thoroughly enjoy the engaging conversations. This evening marks the official start of the HP VIP event, and I can’t wait! Here are some pictures from today’s adventure — click to enjoy! The Pageflex office in Caesarea! Elly drew this fantastic picture representing a potential business model. If you can figure it out, I’ll give you a prize! Nice to see the LookWho’sClicking mouse pad has traveled half-way around the world! Elly’s desk. As I’ve mentioned before, I’m always interested in seeing how people set up their office. The Theatre in Caesarea, which is the most ancient of all theaters found in Israel. The theatre could accommodate 4,000 people! It has a wonderful view of the ocean — absolutely breath-taking! This is the excavated remains of an impressive palace with a pool! I don’t know who this is … let me know in the comments if you do? I love this shot of the acquduct — turned out nicely!